BYOD should mean more than just using your own phone or tablet for work related tasks. This should really be extended to the swarms of coffee machines appearing in offices everywhere. For a while Nespresso machines owned the “I want to save money on cafes” office worker market, but over time more and more easy to use and maintain pod machines have appeared on the market. ALDI has released their own, using their own pods, as has Nescafe with their Dolce Gusto machine. Another brand, Bellini, has also entered this market. Unline the ALDI and Nescafe machines, the Bellini (sold by Target) is compatible with Nespresso pods, and therefore also with Nespresso-compatible pods, like those produced by Piazza D’Oro. Until recently I used the floor’s Nespresso machine, with Piazza D’Oro pods. It was alright, though I suspect it was in dire need of descaling. However thanks to a recent reshuffle, I am now two levels away from the coffee machine. Obviously I needed to get my own. This is where the Bellini machine comes in. Nespresso machines start in the three figure price range. The Bellini was about $80. It also took Nespresso and Piazza D’Oro pods. It was not a hard decision in the end. The weekend after I saw it listed online I had one to bring into the office. It does make coffee. It does little else. There are three buttons to interact with. Power, long shot and short shot. There is also a lever for loading pods. The shot length is preprogrammed and you can not change it (though you can manually stop it) and unsurprisingly if you want to froth milk, you may need to get a different machine. Its greatest issue is its boiler. The longer you run a shot, the hotter the water gets. Unless you are a masochist, this pretty much rules out long shots. Unless you like the taste of throughly killed coffee you are better off using the short shot button. Fortunately it seems to be able to do these with a reasonable level of consistency. 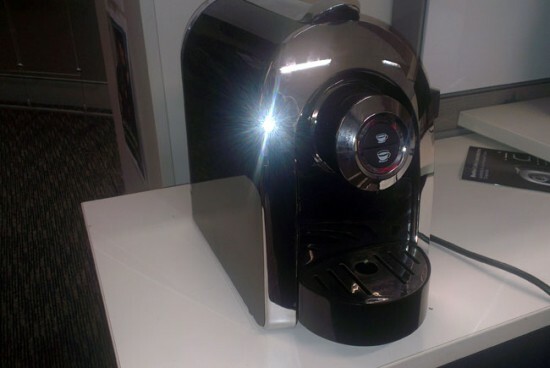 While the Bellini is most certainly not a Nespresso machine, let alone a decent manual coffee machine, it does make for a good cubicle buddy. For the price and the fact that there is more than one store where you can get compatible coffee pods, there is little reason to recommend other machines over it at this price range.